Flowers are a way to commemorate life's most significant celebrations. From birthdays to weddings, they are essential to almost all family occasions. Funeral flowers continue to hold great importance to most funeral traditions and services today. Let JEANNIE'S FLORIST help you choose the perfect tribute to express your feelings for the departed. We are experienced in delivering to all funeral homes in Porter and the surrounding areas. If you are looking for standing funeral sprays in JEANNIE'S FLORIST, Porter can help. 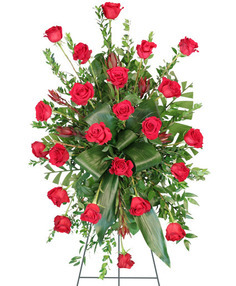 We specialize in funeral flowers and can create the perfect memorial for your final tribute. Order your floral standing spray online or call us at (281) 354-0610 for something more custom. Casket sprays offer a final tribute to a departed loved one. It's beauty and elegance sets the tone of the funeral service. There are two types of casket arrangements: full couch and half couch. 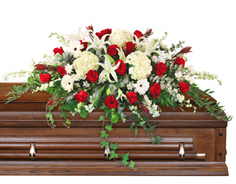 Full couch is for a closed casket, and half couch arrangements are typically used for an open casket. Flowers for cremation services are also available. 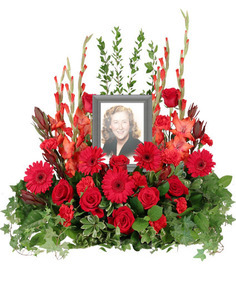 For any type of funeral flowers in the Porter area, JEANNIE'S FLORIST is here to help. 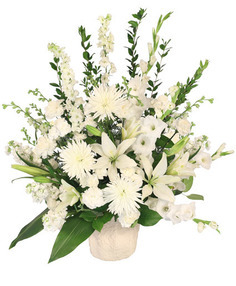 A sympathy arrangement is the perfect way to say what you need without saying anything at all. Flowers uplift spirits and remind us of happier occasions. 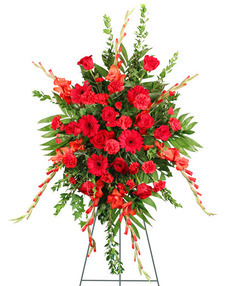 For sympathy arrangements or any type of funeral flowers in Porter TX, JEANNIE'S FLORIST is here for you. Flowers serve as an inspiration and a tribute to friends and loved ones during trying times. Cremation urn and memorial flowers can act as a personal expression of love or as a warm send-off. When you work with JEANNIE'S FLORIST, we endeavor to illustrate the essence and memory of your loved ones with a beautiful floral expression of their lives. Our selection of floral inspiration covers a wide variety of personalities and tastes. Looking for something different, or want to add a personal touch? We also do custom arrangements. Call for pricing.